Early last year, a North Korean IRBM crashed in a populated area. What does that tell us? The April 28 failure merits close analysis, especially as North Korea continues to carry out flight-testing of its various ballistic missile platforms from a range of new test sites. In 2017, North Korea has introduced new sites for missile testing, arguably to demonstrate the flexibility of its Strategic Rocket Force. It has even carried out ballistic missile launches from a restricted area at Pyongyang’s Sunan Airport, which also serves as the country’s primary civil aviation facility and the entrypoint for most non-Chinese foreign visitors to North Korea. The potential for similar accidents occurring over Pyongyang, the country’s capital, or other populated regions remains high, especially with untested systems. These risks may even serve to explain why North Korea chose to use the seaside town of Sinpo as its initial test site for the first two failed Hwasong-12 launches in April. An early in-flight failure over the sea would have a lower chance of striking any human infrastructure — certainly populated urban areas. However, since April, North Korea has not carried out any further ballistic missile testing from Sinpo (with the exception of four submarine-launched ballistic missile ejection tests). In April, most reports of the circumstances of this launch were sparse, noting only that North Korea launched a single missile that failed in flight. U.S. Pacific Command stated that the missile was launched from “near” Pukchang Airfield, a previously unused launch site for North Korean ballistic missile testing. As The Diplomat first reported in June, contrary to other reports at the time, the three missiles tested in April were not anti-ship ballistic missiles, but a new type of intermediate-range ballistic missile. Toward the end of the slideshow, which was mostly shown in chronological order, the North Koreans helpfully included photographic evidence of Kim Jong-un inspecting all three of the failed April Hwasong-12 launches, including the April 28 launch out of Pukchang Airfield. These photographs are composed in a manner similar to the images North Korea publicly releases through its state media after successful launches; had the launches succeeded, it is likely that we would have seen these images in Rodong Sinmun immediately afterward. Images from ICBM celebration concert showing the Hwasong-12 launch from Pukchang Airfield. 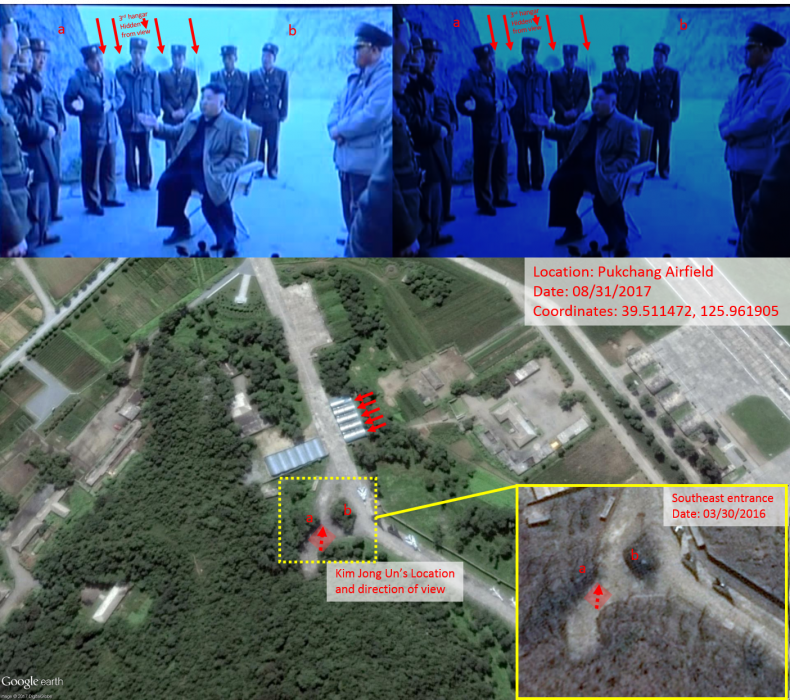 Using the images of the April 28 test from the Hwasong-14 ICBM celebration concert, we were able to geolocate one of the scenes to the southeastern entrance of of the underground hangar at the Pukchang Airfield. 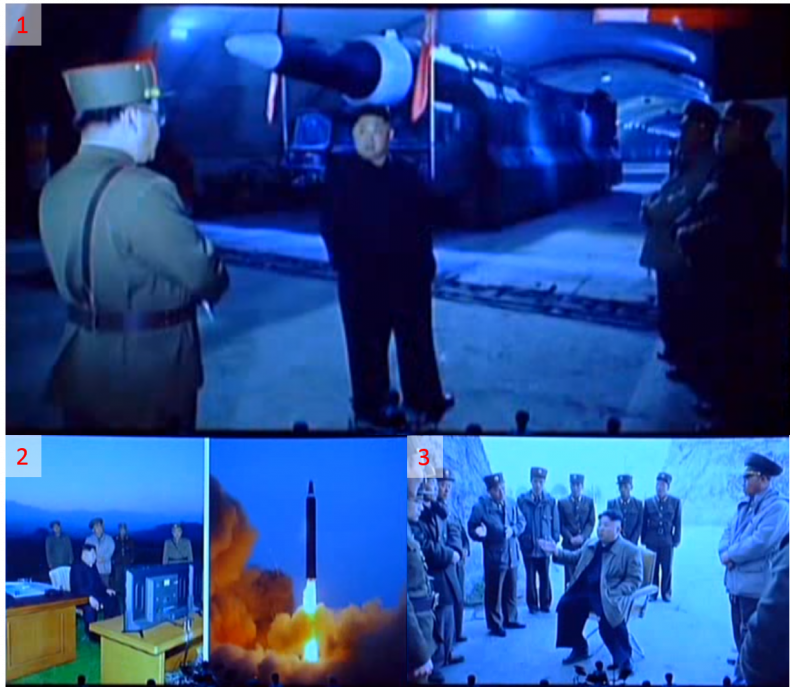 The scene above shows Kim Jong-un inspecting the new IRBM in an underground hangar (1), images of the launch and Kim Jong-un at his viewing position (2), and an image taken right outside of the underground hangar (3). In image 3 (above), we can see 4 of the 5 hangars that were added to the site sometime after July 2016, as Kim Jong-un is sitting in front of the entrance to the southeast underground hangar with the earth wall and mound feature present. An image from Google earth of the complex show ground disturbances in an area that previously contained a building with fencing, also showing that a portion of the seasonal greenhouse had been damaged near the side of the complex where the debris fell. Using Planet Labs’ high frequency satellite images of this site, we can narrow down the date which this change occurred, which was sometime between the 26th and the 29th, or the two day window in which the test is known to have occurred. 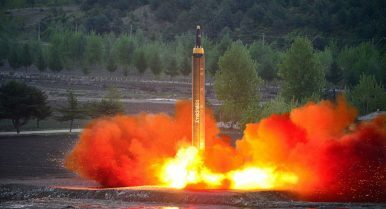 Liquid-fuel missiles like the Hwasong-12, which use a highly volatile combination of hypergolic propellant and oxidizer (meaning that the two agents ignite spontaneously on contact), can produce massive explosions depending on how they fail. 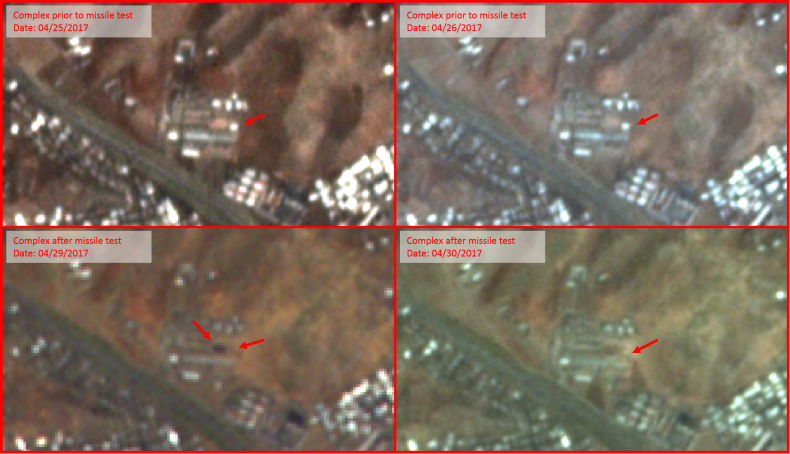 In this case, with the missile having survived its descent following an engine failure, it is likely that this facility at Tokchon experienced a large explosion upon impact. It’s impossible to verify if the incident caused any loss of life and, given the time of day the test occurred and the location of the impact, it may be likely that few, if any, casualties resulted from the incident. However, as the Google Earth imagery of the incident demonstrates, the Tokchon facility is located adjacent to what appear to be residential and commercial buildings. A slight difference in trajectory may could have resulted in an even more catastrophic accident over a populated region. 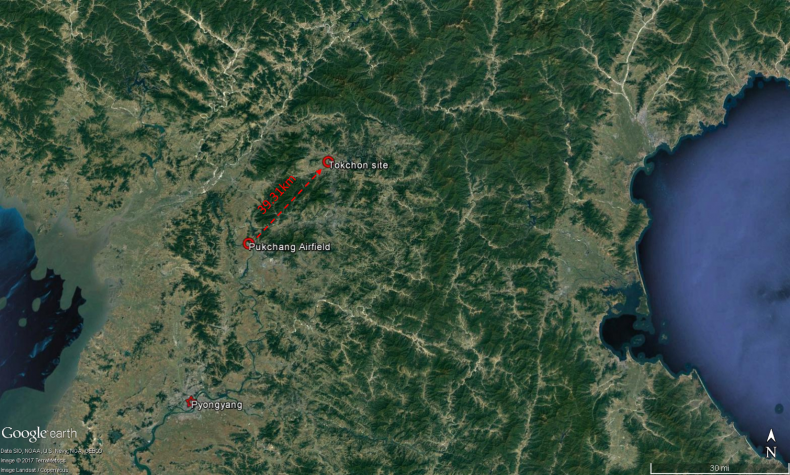 To be sure, this North Korean incident is far from the first tragedy involving rocketry near a civilian area. In February 1996, a Chinese Long March CZ-3B satellite launch vehicle failed shortly after launch from the Xichang Satellite Launch Center in Sichuan. Raw video footage of the incident conveys the immense damage resulting from the explosion, which took place near a populated area. The Chinese government never released a full accounting of the loss of life resulting from the accident and public estimates vary. Even beyond the human and economic damage potentially caused by such a failed launch, North Korea, since August 2017, has started launching ballistic missiles over Japanese territory. It has done so twice with the Hwasong-12, succeeding both times, with the reentry vehicles splashing down in the northern Pacific Ocean, clear of Japanese territory. But future successes are not guaranteed and should a future North Korean missile overflying fail at the wrong moment during its powered flight phases, its trajectory may come to resemble an attack on Japan. Even with a dummy payload, an incident like that could spark a serious crisis in Northeast Asia. North Korea’s missile tests, which violate its obligations under United Nations Security Council resolutions, come with no formal warning or notices to airmen, leaving regional states and the United States to their own devices in interpreting Pyongyang’s intentions once the engines are ignited. 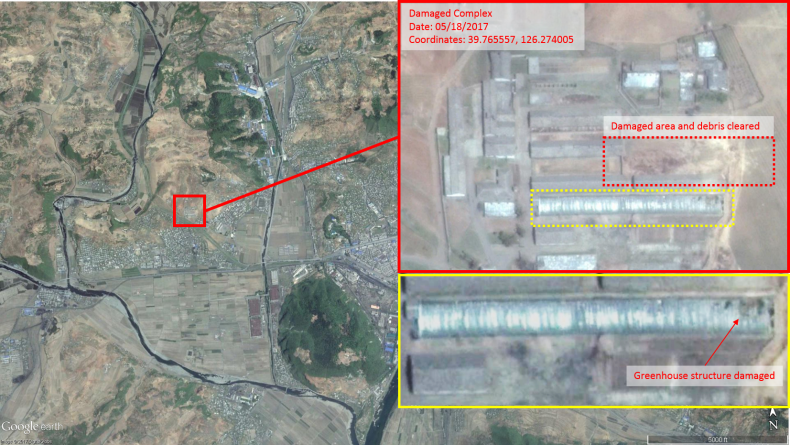 Aside from the safety implications of North Korean launch practices, the few images associated with this test offer insight into the country’s pre-launch storage practices, with implications for U.S. and allied attempts at potential preemption and prevention. As seen in image 1, had the launch succeeded, Rodong Sinmun would likely have printed an image of Kim Jong-un standing in front of the transporter-erector-mounted IRBM in a hardened tunnel. That would have (and now does) send a dire message to U.S. and allied military planners: North Korea’s missiles won’t be sitting ducks at known “launch pads,” contrary to much mainstream analysis. What’s more, the proliferation of newly constructed hangers, tunnels, and storage sites cannot be assumed to stop at the Pukchang Airfield. Similar facilities likely exist across the country. In 2017, not only has North Korea tested a massive variety of strategic weaponry, but it has done so from a more diverse list of launch sites — what the U.S. intelligence community calls “ballistic missile operating areas” — than ever before. Gone are the days of Kim Jong-un supervising and observing launches at a limited list of sites that’d include Sinpo, Sohae, Wonsan, and Kittaeryong. It is true that missiles like the Hwasong-12, Hwasong-14, and even the new behemoth, the Hwasong-15, all use liquid fuels and must be fueled prior to launch. (North Korea’s Pukguksong-2 medium-range ballistic missile uses solid propellants and does not have this limitation.) Even with this fueling requirement, U.S. and allied intelligence would have at best a couple hours to detect launch preparations. Finally, though riskier, North Korea could fuel these missiles in a horizontal configuration within their hardened storage sites and use its road-mobile transporter-erector-launchers to launch them with fewer pre-launch signatures. As North Korea’s production of now-proven IRBMs and ICBMs continues, it will have a large and diversified nuclear force spread across multiple hardened sites, leaving the preventive warfighter’s task close to impossible if the objective is a comprehensive, disarming first strike leaving Pyongyang without retaliatory options. The time is long gone to turn the clock back on North Korea’s ballistic missile program and its pre-launch basing options. Ankit Panda (@nktpnd) is a senior editor at The Diplomat. Dave Schmerler (@DaveSchmerler) is a research associate at the James Martin Center for Nonproliferation Studies at the Middlebury Institute of International Studies at Monterey. The authors are grateful to Jeffrey Lewis for imagery assistance and Curtis Melvin for geographical assistance and facility identification. The parade mostly featured familiar missiles, but offered important insight into Kim Jong-un's ambition. Why North Korea Is Likely Planning a Satellite Launch in 2018Exclusive: Revealing Kangson, North Korea's First Covert Uranium Enrichment SiteThe Hwasong-15: The Anatomy of North Korea's New ICBMMilitary Stalemate: How North Korea Could Win a War With the USWhat Would the Second Korean War Look Like?